The Italian GP is done, won by Mercedes‘ diver Nico Rosberg, to be closer to Lewis Hamilton in the rank in the F1 championship standing. Ferrari was 3rd and 4th, advantage to Vettel over Raikkonen, 5th was Red Bull‘s Ricciardo. 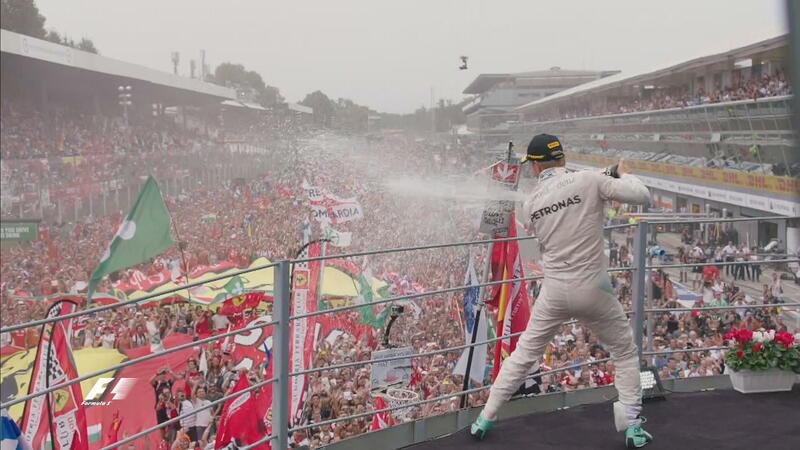 The depart was won by Rosberg, Ferrari did an excellent start , jumping from the second row, to 2nd and 3rd. Hamilton found himself in the 6th place. Vettel ran second most of the race, he found himself third after his second pit stop. Mercedes was limited to just one stop starting with the soft tires, but Ferrari had an extra stop. Red Bull, who weren’t at their best, finished 5th and 7th, separated by Bottas. The point difference between Ferrari and Red Bull was reduced to just 11 points. Ricciardo won the battle for the 5th place against Bottas with an excellent late breaking and early acceleration at the first S turn after the long start/finish straight. Alonso, who finished 14th, did not go home empty handed, he won the Grand Prix best lap time with a 1:25.340, a record to his name. And even though it was Rosberg who won the Italian Grand Prix, the general ambiance was pure Italian, even at the podium, there were too many Red tiffosi and a lot more Ferrari flags. Spa Francorchamps : The after race. 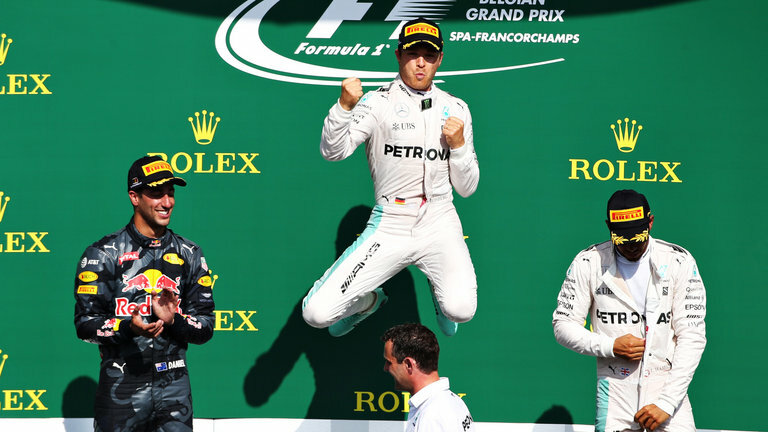 The F1 Belgian Grand Prix ended with a win for Mercedes , Nico Rosberg, who started from pole, carried on until the last lap, managing the advantage he had on his direct chaser, on the second march of the podium, Red Bull driver Daniel Ricciardo and to the big surprise of everyone Louis Hamilton closed the last march. It was a pretty thrilling race, with a Ferrari crash at the start with Verstappen, a virtual Safety car, a huge crash by Kevin Magnussen, a safety car and red flag. 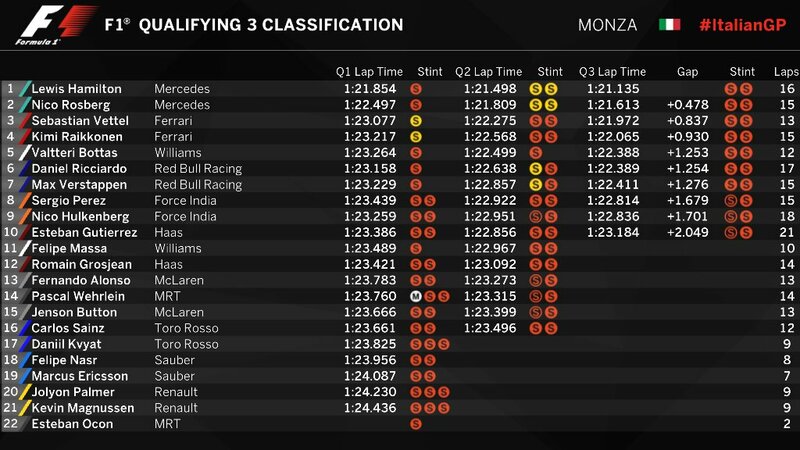 The Race first stage : Penalties served, Hamilton sat on the last line with Fernando Alonso, before them was Gutierrez for Haas F1 who was serving a 10-places grid penalty and Marcus Ericsson who preferred to start from the pits. Pole was for Roseberg, next to him Verstappen and in the second line, the two Ferrari Horses ready to prance at any moment. Red lights gone off, Ferrari did an amazing start, until getting to the La Source virage, this is where all went funny : Vettel closed on Raikkonen who was pushing with Verstappen. It resulted in Vettel losing control over his car, waited for the field to clear to go again racing, Raikkonen sustained a puncture and front wing damage and Verstappen lost a chunk from his front wing. At the first lap, right after the Les Combes straight, Manor driver, Pascal Werlhein cleaned Jenson Button off the track, and carried him from behind, the two drivers quit. Carlos Sainz suffered a car puncture and tire explosion which ended his race. 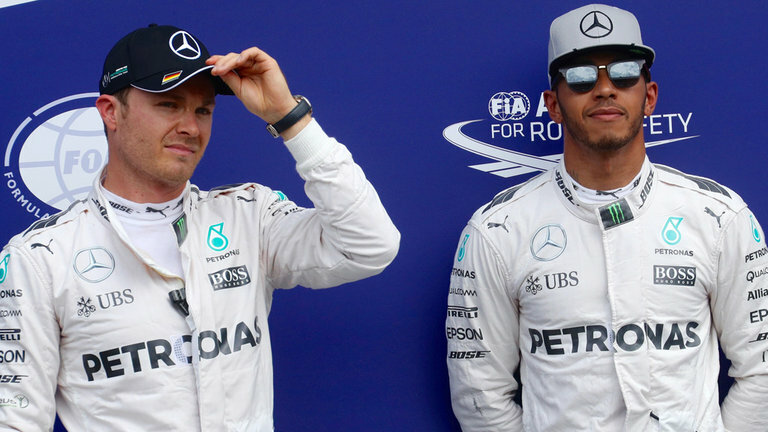 It all turned to the favor of Williams, Force India’s Hulkenberg, and Hamilton who grabbed a few places. At the end of the first lap, Roseberg was in the lead, then Hulkenberg and Ricciardo. Hamilton was 15th. The race carried on being eventful, until the 9th lap, where Magnussen lost control over his car in Radillion Eau Rouge, went in all directions and hit the tire wall. The crash was due to loss of control over the back of the car. Charlie, the race director ordered a safety car right away, but it lead to a 17 minutes red flag, until the tire wall was fixed. teams took their chance for change of race strategy, fixing damage on the cars. Race Restart : The race restart was behind the safety car, who existed at the 11th lap. The drivers made use of fresher tires, and especially the long straights for impressive overtakes. Raikkonen and Verstappen touched once again, the Dutchman could have taken Ice Man into pieces while defending his place. Having an aggressive defense strategy and waiting for his opponent to go in a direction or another so that he makes his mind. Alonso, 3rd after the restart, had to undergo overtakes one after the other, to finish the race in the 7th place, 1 minute behind the lead. Hamilton, carried his way, but did not achieve more than the third place, the gap in the championship was reduced by 10 points, and Roseberg is second just by 9 points. Force India did a nice race in general, finishing 4th and 5th, advantage to Hulkenberg over Perez, they scored precious points and getting to the 4th place in the constructors championship. Hamilton did the fastest lap of the race, cars being full on fuel, and tires being more used, he did a 1:51.583. Despite having a one stop strategy, Verstappen finished off the points, the last point was grabbed by Felipe Massa for Williams.